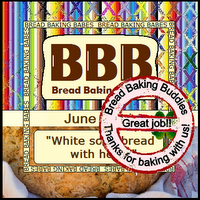 This month the Bread Baking Babes are baking Irish Soda Bread. I looked at the photos of this bread and it looked delicious. Nice color and funny shape. The crumb looked like cake. And that’s funny because I just made my first Banana Bread which is more like cake. It is so delicious I had to bake a few and give them to our Thai friends. They love them. It took me a while to bake this Banana Bread, because I don’t like the name. Oke, it sounds crazy, but for me it workes this way. Maybe because in Dutch it sounds even worse; bananen brood. But, luckily I like to experiment and baked it anyway. So this Irish Soda Bread reminded me of the Banana Bread. Peter said I had to bake it, because “it looked delicious with the thick butter on the slices”. When I looked at the recipe I found out we didn’t had: fresh rosemary, sage and chives. And there is no buttermilk to be found where we live. We went to Chiang Rai, a big city 2 hours drive from our house. We did find a rosemary plant, and how happy this makes me. Also we found dried sage. But, still no buttermilk. I had to make it by myself. We still had a little bit of starter culture to make cheese and we bought milk. After 2 days (one day out of the refrigerator and one day in the refrigerator) we had something that looked like buttermilk. It smelled slightly sour. When the bread came out of the oven I was very pleased, it looked nice. Good color and the kitchen was full of rosemary flavor. We wanted to eat it that evening. That afternoon I had made new peanutbutter with peanuts and cashewnuts. This will be a nice combination, we thought. But, when we had our first bite, we looked at each other and said; ‘this is not as delicious as it looks. It has a chemical taste’. The bread had a nice rosemary flavor, some sage and tarragon. But there was something else that we didn’t like. Maybe it’s the tarragon? Maybe it’s the baking soda? Maybe it’s a “Dutch-thing”; Bread Baking Babe Lien also didn’t like the smell and taste of this bread. It was nice to bake this bread, it was quick and looks beautiful and the chickens liked it! 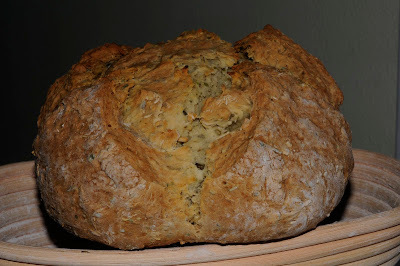 Ilva of Lucullian Delights used the recipe she found at The Ballymaloe Bread Book by Tim Allen. I use the recipe found at Ilva’s blog. Heat up the oven to 230˚C. Sieve the flour, salt and bread soda into a large, wide mixing bowl. Add the freshly chopped rosemary, dried sage and dried tarragon to the dry ingredients. Make a well in the centre. Pour most of the buttermilk into the flour. Using one hand with the fingers open and stiff, mix in a full circle drawing in the flour from the sides of the bowl, adding more buttermilk if necessary. The dough should be softish, not too wet and sticky. The trick with all soda breads is not to over-mix the dough. Mix the dough as quickly and as gently as possible, keeping it really light and airy. When the dough comes together, turn it out onto a well-floured work surface. Wash and dry your hands. Gently roll the ball of dough around with floury hands for a few seconds, just enough to tidy up. Then pat it gently into a round, about 5 cm/2 in high. Place the dough on a lightly floured baking sheet. With a sharp knife cut a deep cross in the middle of it, letting the cuts go over the sides of the bread. Then prick the four triangles with your knife: according to Irish folklore this will let the fairies out! Put this into your preheated oven for 10 minutes, then turn the heat down to 200˚C F for a further 25 minutes, or until cooked. When the bread is cooked it will sound hollow when tapped. Thanks for baking with us this month. We're still discussing what it is about this chemical smell thing some find offensive and others don't notice. There are still some mysteries in life and bread baking in particular. This bread looks dleicious, thanks for hosting bread baking day. Regarding curry leaves they gives aroma and flavor to the dish. It is commonly used in South Indian cooking. Great explanation, thanks for the posting!